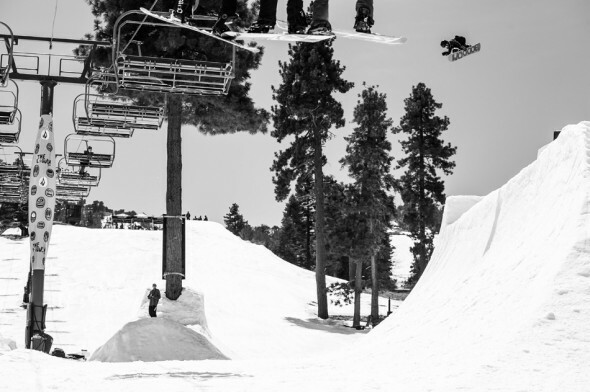 …Over the past six years, SNOWBOARDER Magazine has hand-selected cadres of up and coming riders and worked with some of the best park builders in the US to create playgrounds progressive enough to compliment the level of talent. Many young snowboarders have set the first flag of their snowboarding career within the run-ins and landings of The Launch parks. Mark McMorris, Tyler Flanagan, Garrett Warnick, Jamie Anderson, Sage Kotsenburg, Trevor Jacob, Greg Bretz, Sarka Pancochova, Johnny Lazz, Seb Toots, Forest Bailey, Zak Hale, Stale Sandbech, and more have all made turns at the Launch. …The youngest snowboarders at The Launch sped through the park all day with boundless energy. Hour after hour, Cody Warble, Brock Crouch, Red Gerard, Toby Miller, and crew lapped the park in a tight collective, airing effortlessly out of the hip, sessioning the double rail on the smaller quarterpipe, and throwing snowballs at one another. These kids, half as tall as many of the other riders at The Launch, are next level. They boosted one-by-one over the bottom jump, a line of brightly-colored sweatshirts and black helmets, with style far beyond their years riding. If the abilities first wave of Launch groms are any indication of the future of this current crew, we’re more than excited to watch them grow up, and maybe blow up. This entry was posted on April 5, 2013. It was filed under Uncategorized.